Summary for the Busy Executive: Looking for The Great American Symphony. Once upon a time, between the two world wars, many writers nursed the ambition to birth the Great American Novel. They even entered into competition with one another – Hemingway feeling the contest most keenly. At the back of this lay the idea of the novel's centrality to the culture – an ideal and example at least as old as Dickens – and of its suitability for containing the truth of the times. Serious art served a social function for the culture at large. Currently, the culture at large could care less, although as recently as the Seventies, certain poets in the United States, Latin America, and Eastern Europe occupied a position where they were taken seriously by people other than other artists. I doubt now very many would recognize the names Galway Kinnell, Jared Carter, Philip Levine, Robert Bly, Robert Haas, or Donald Hall. However, times change, and they could yet again occupy that central point. Now, however, to paraphrase Gore Vidal, saying "a famous novelist" is like saying "a famous ceramicist." And whatever their literary merits, I don't think anyone would want to argue for centrality or serious cultural engagement in the novels of Stephen King, John Grisham, Danielle Steele, or Tom Clancey. Indeed, the idea itself of a central culture (other than the mass, commercial culture) is right now, at any rate, not a particularly strong one. Something similar happened in American music between the wars. Many composers energized themselves with the desire to connect with people who didn't normally go to classical concerts and to define a body of music not only as good as Europe's, but expressively and recognizably American. The ambition found its object in the symphony – a genre many Europeans considered dead by that time (note that Bartók never wrote one) – rather than opera (the vessel of 19th-century ambition) or some "organic" form. To a great extent, Stravinsky and Hindemith's neo-classicism showed the way. This CD brings together three different approaches from three very different composers – all of whom, however, I think shared similar aims about the cultural impact of their work, and all of whom suffered from critical neglect in the years immediately after the war, as serialism supplanted neo-classicism as modern music's lingua franca. With the weakening of serialism as a major musical force over the past twenty-five years or so, some of these composers seem to be coming back into notice. Roy Harris made the symphony central to his output and, with Copland, tried to define musical Americana. His results, less Stravinskian than Copland, have a strong French flavor of 19th-century form to them, particularly the cyclicism of the School of Franck. The rhythms and melodic shapes, however, are cleaner and more incisive. Harris also shows great interest in counterpoint, with fugues and canons permeating his work. 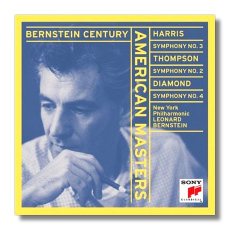 At one point in his career, many considered Harris the really great American symphonist. Koussevitzky proclaimed Harris's third the best written by an American. Most of Harris's other symphonies have made their way back to oblivion – a shame, really, since he is an incredibly interesting musical mind. This stems partly from shifts in fashion after World War II, partly from Harris's career mistakes. Other composers, joking about his outsized ego, made the mistake of dismissing the music because of it. I think him too good to lose, and I wait for a revival. Bernstein recorded the third at least twice – once for CBS/Sony and later for DGG, both with the New York Philharmonic. I prefer the greater rhythmic intensity of the Sony recording, the one on this CD. Bernstein got not sloppier (he was never all that rhythmically precise, compared to Koussevitzky, Szell, or Reiner) as he grew older, but certainly less lively and more solemn. In almost every case of re-recording repertoire, I prefer his earlier recordings to his later ones. People know Randall Thompson, if at all, as a church or choral composer, but he wrote in almost every genre and produced three symphonies. All his symphonies owe something to 20th-century French music and Stravinsky, but the second strikes me as his best and as something that has a shot at real popularity. It reminds me in many ways of Dvořák's "New World," particularly the slow movement. It's filled with wonderfully memorable tunes, many of them evocative of Appalachian folk songs and dances. Of the three symphonies on this program, this is the most traditional. Yet it's obviously a 20th-century work. Bernstein's acquaintance with it goes back to his student days. He studied orchestration with Thompson at Harvard. By the way, contrary to popular misconception, Bernstein never studied composition itself in a classroom. He learned by doing and by submitting scores to friends like Copland and Diamond for criticism. Bernstein also conducted Thompson's symphony very early in his career. When he made this recording for CBS, there was a note of nostalgia and looking back. Thompson had retired not only from teaching, but from the professional music scene altogether. Bernstein's recording (coupled with William Schuman's "To Thee, Old Cause") caught many music observers by surprise with a name most hadn't thought of in years. Some expressed surprise at the sophisticated simplicity and loveliness of the work, but it wasn't really enough to buck current critical trends and inaugurate a Thompson revival. There have been boomlets in Thompson's stock since, but nothing lasting. I prefer Bernstein's reading by far to Andrew Schenck's on Koch. The New York Philharmonic plays better than the New Zealand Symphony, and Bernstein invests the work with far greater depth. Of all his symphonies that I've heard, I like Diamond's fourth the best. Of the symphonies on this program, Diamond's lies closest to Stravinsky and thus sounds the most "modern." It shows less of a sense of adventure in discovering an idiom and more acceptance and consolidation, but then again Diamond belongs to the generation after Copland, Harris, and Thompson. He stands on their shoulders. One hears in it the modern, modally-inflected counterpoint of Harris (as well as a "crib" from Poulenc in one of the motives) but with more of a Coplandish or Pistonian chordal spacing and orchestral sonority. If I remember correctly, Diamond wrote it on the death of Koussevitzky's wife, and I consider the opening movement one of the noblest in American music. Bernstein's reading outstrips Gerard Schwarz's very fine one on Delos, again lending the music a weight (especially in the slow movement) not found in other accounts. For me, this repertoire – American neo-classicism – makes up the core of what Bernstein did best. One hears an intellectual liveliness and an emotional gravitas without the over-inflation of his later work. With Koussevitzky and Mitropoulos, he remains one of the great champions of American music. We hear something very close to its creators' intentions – a serious music, recognizably American, inviting everyone to listen. Since this music is not otherwise readily available and these readings are superior to every other I know, a disc to seek out.